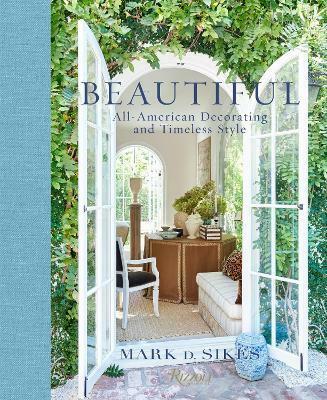 The first book from interior designer Mark D. Sikes is a celebration of American style today, showcasing chic and accessible ideas for every home. Modern and unfussy, Mark D. Sikesâ€™s interiors are classic takes on California indoor/outdoor living, with natural fibers and crisp coloration, informed and influenced by the fashion world where he began his career. In eight chapters, he explores approachable, stylish looks, from "Blue and White Forever," which features indigos, stripes, batiks, and wicker in casual rooms such as porches and pool houses; to "Timeless Neutrals," presenting semiformal rooms filled with chinoiserie, gilt, glass, mirrors, banquettes, and French chairs; to "Garden Greens," featuring happy, casual family rooms and kitchens inspired by the garden with treillage woodwork, rattan, and cotton. There are also "Beautiful Brights," colorful rooms that are eclectic, layered, and fun, with chintz, florals, and Middle Eastern influences; and "Sun Faded Hues," rustic coastal rooms with weathered fabrics and furniture. Each chapter presents light-filled images of the designerâ€™s looks and offers the reader inspiration and advice.As famed film director Nancy Meyers writes in the bookâ€™s foreword, this is a book that shows design lovers "how classic can look fresh, how style and comfort go hand-in-hand."